At the heart of any European is a bridge with thousands of locks. The fact is that just twenty years ago, there was a tradition of "bonding" feelings this way. Believes that if lovers hang a lock on the bridge railing, throw the key into the water, nothing will ever be able to destroy the Union of their hearts. Despite the fact that this tradition seems to be very romantic and vintage, it appeared only in the nineties. Italian writer Federico Moccia for one of his novels could not invent, as it lovers the heroes swore an oath of loyalty and love each other. Since the action in his novel happened in Rome, he wanted to find a special romantic spot in the Eternal city, and it was not there. Therefore, the author invented their own tradition. He was appointed to Ponte Milvio, this place is for all the lovers of Rome, where his characters are brought to each other vows with a padlock and threw away the key. Since the Roman Ponte Milvio covered with locks, so to discern it beneath them became difficult. Once under the weight of the locks has fallen lamppost on this bridge. The power of Rome tried to intervene to structure somehow this tradition, but without success. Italian lovers never gave her shelter and continued to hang the locks on Ponte Milvio. Over time, this tradition spread throughout Europe. And there is swearing in this way can any couple, but in our country, the castles, primarily associated with the wedding. In Moscow, for example, Luzhkov bridge became a place of pilgrimage for half of all young couples of the capital. However, in the case of Luzhkov bridge, the city authorities have been very clever. Near the bridge was established the Tree of love whose branches can withstand thousands of these locks and vows, not causing harm to anyone. After a very short time at the Tree of love there are still a few relatives, because the branches of the same structures all the locks did not fit. Now next to the Trees of love on Luzhkov bridge are also benches for quarreling lovers. Their design assumes that either sat down on the edge of the people will still roll to the center. The castles with the most popular bridges are cut to free up space for new. So it makes sense to hang your clasp away from the popular places, so it lasted a little longer. 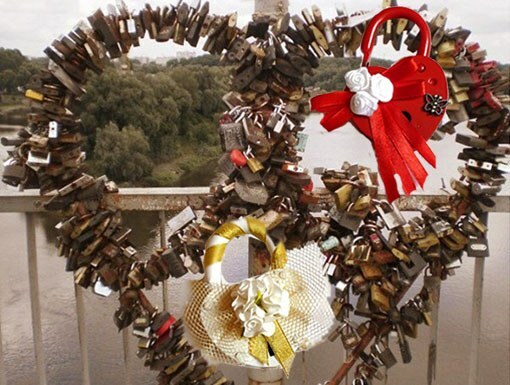 In the Slavic traditions and bridges, and the locks were widely used. After the wedding, when the bride enters into her husband's house, near the threshold have always been an outdoor castle. When young passed inside, the castle is closed, the key thrown into a deep well. Sometimes drowned and the castle, which is metaphorically a marriage. Until now, many grooms before the wedding move through the seven bridges, because it promises happiness. Bridges in the Slavic tradition has always been considered a symbol of the transition. Therefore grooms often worn by brides across the bridges to the marriage was a happy one. So the new tradition of locking vows well taken root on Russian soil. Hang castle during the wedding, it is accepted in many countries. The modern custom came from the pages of a novel by Italian writer and caught on, despite the fact that Russia has its own rituals associated with locks and weddings. After painting in the registry office the newlyweds travel to wedding way traditional destination weddings. Be sure to include a visit to the bridges where you are just two of the ritual. The groom should carry the bride in his arms across the bridge and together they put a padlock on the fence. Lock locked, and the keys thrown into the water. It should symbolize love, closed tightly and protected from bad interference in the relationship of the couple. And free, inspiring? Somehow it does not fit the lock with a boundless joy. Locks bought in conventional stores or make to order. Engraved with names and dates of marriage, make labels. That lack of imagination of organizers and customers of the ceremony. Where did this custom and how old he is. Custom from the category of fashionable and artificially introduced into life. Lived in Italy writer Federico Moccia, wrote a book called "Three meters above the sky". And the thought occurred that the characters in his novel have the oath of allegiance to fasten a lock, locked on the grid of a Roman bridge across the Tiber river. After the book's publication in 1992, the custom, like a snowball, rolled in the light. The lovers rushed to hang locks on the fence all bridges in all the cities of the world. From them it was intercepted by the organizers of weddings, is included in the scenario of weddings. Custom has become a punishment and a headache for city authorities. The bridges that adorn the city with their delicate grids, has turned into an ugly, bristling of different-sized locks something. 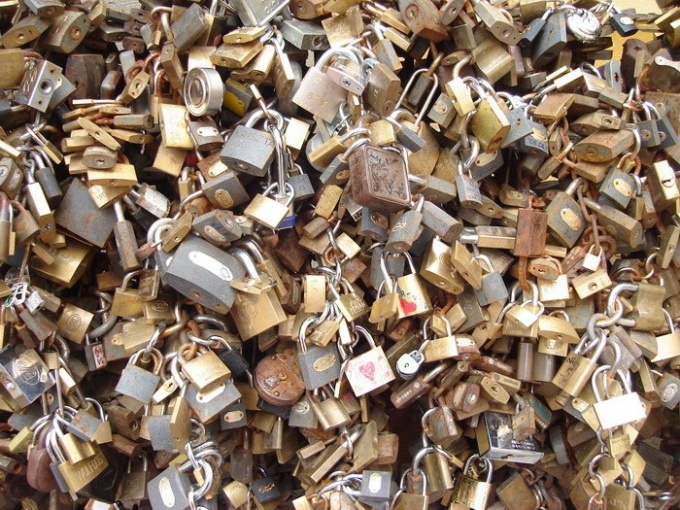 Regular locks are cut and discarded that completely denies the custom of the meaning of "bond of eternal love." Why would hang a symbol of inviolability if it is in the next RAID trite cut off and thrown in the landfill? At the same time, if you ask all the participants of wedding ceremony, from the newlyweds to the guests, whether they have read the book of Italian, few would answer in the affirmative. "Taken, like, hang the locks, that hang". Omens and beliefs about castles in ancient Russia. Meanwhile, in pagan times, in Russia существовалb their own rituals and signs associated with locks and creation of a new family. They had a slightly different meaning and different in execution. It was believed that when the couple takes the young wife over the threshold of their joint home (right after that and before you include someone else), under the threshold buried or hid the castle. The key was thrown into a place where nobody could find him. Thus, lock is not love itself, and peace and prosperity, the prosperity of the new family nest. In other embodiments, the lock is hidden under the threshold of the future home the bride and groom after the engagement, that would be no one and nothing could disrupt arrangements for the wedding and to destroy the relationship between the lovers. This Russian custom, full of meaning, it seems most appropriate in the wedding ceremony. And the rite observed, and the appearance of city bridges is not spoiled. Now, thanks to Internet awareness, many newlyweds refuse senseless new tradition to hang the locks during the wedding. They are looking for in the traditions of his people rituals, amulets, in which our ancestors believed, and which a lot of more sense and wisdom.